In the latest release from Histoires de Parfum, the brand’s perfumer Gérald Ghislain found his inspiration in American author, Ernest Hemingway. While I’m not as well read on the Nobel Prize winning author’s work, I did read an Old Man and the Sea in middle school. A quick search reveals he was quite the rolling stone having had four wives and lived in Cuba and the U.S. I suspect the scent’s sharp opening, which is unequivocally masculine, can be attributed to Hemingway’s “most interesting man in the world” appeal. 1899 opens with a blast of vitality. It’s one part boozy, one part sweet and delightfully spicy. While there are no tobacco notes listed, every time I wear 1899, I envision wearing a fisherman’s sweater while lighting a pipe by a crackling fire. Perhaps that’s the old man by the sea fantasy that lies in the depth of my subconscious but the opening does remind me of the sweetness associated with pipe tobacco. Nevertheless, Italian bergamot, juniper berry and black pepper really do a nice job of setting the stage for Ghislain’s homage to Hemingway. If you’re a fan of cinnamon I suspect you’ll like 1899, as it’s prominent throughout. I like that vanilla is also used as it softens the scent’s spiciness a bit but the character remains. As 1899 dries down, it becomes the type of skin scent that raises an eyebrow ever so interestingly. It’s soft and woodsy with just a bit of the opening sweetness remaining. 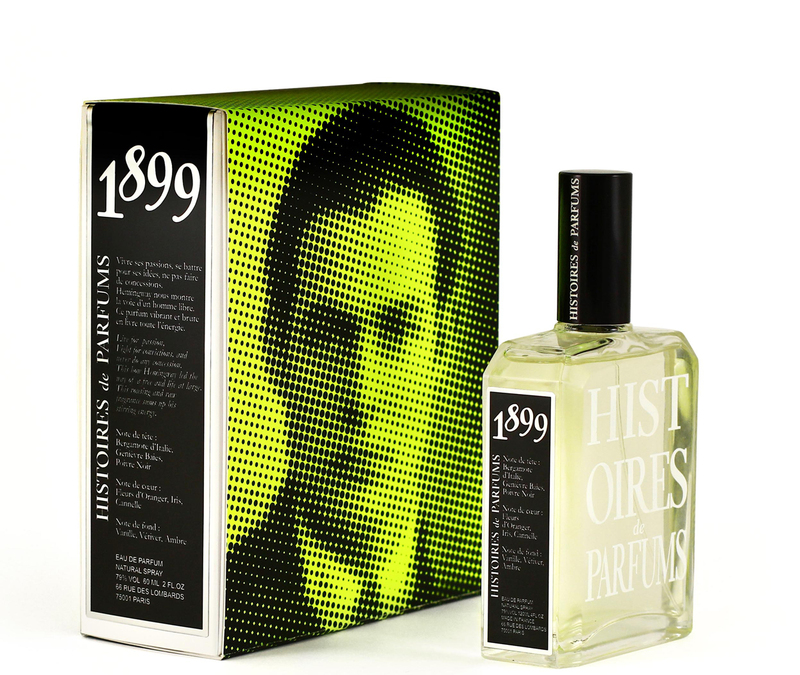 I wouldn’t classify 1899 as an office scent, but that didn’t take away from its likeability factor. I’ve been wearing it a lot and it’s become a fall favorite. I suspect a lot of guys will like 1899. Its presence is strong and bold and there’s no questioning whom it’s meant for. That said, I could still see women wearing this and wearing it well. I remember I smelled Comme des Garcon 2 Man on a woman and it blew my mind. I think 1899 would do the same. Put this on your “ to sample” list gents. It’s a winner in my book. This entry was posted in Fragrance Review and tagged details, Ernest Hemingway, Fall scents, Gérald Ghislain, Histoires de Parfum, Men's Fragrances, new mens fragrances, Office Scents. Bookmark the permalink.